The earliest record which can definitely be attributed to a building called Tile or Tyle Kiln Farm or house on this site (at the far end of Tile Kiln Lane) is in April 1594 when Edmund & Roger Partridge of Tile Kiln were appointed Feofees of the Boxmoor Trust. Five years later in 1599 -"Henrie Partridge of the Tylekill” was buried at St. Mary's Church Hemel Hempstead. The property undoubtedly preceded these dates, and given the excellent brick clay in the vicinity it is likely that there was a house on the site associated with the making of tiles and bricks from as early as Roman times. It is extremely likely that the 13th century reference to an area call Tile Kill in the parish records for Hemel Hempstead [VCH Vol 2 p.216] also refer to property on this site. In 1603 Tile Kiln House (Tile Kiln Lane) was first mentioned in the Manor Court Rolls for Hemel Hempstead. It remained with the Partridge family for some time as on June 23rd 1611 - "Sarah the daughter of Roger Partridge of the Tile Kill," was Baptised at St. Mary's Church Hemel Hempstead, and in 1628 Roger Partridge of Tile Kiln was Bailiff of Hemel Hempstead. By the middle of the century the property was in the hands of another Boxmoor Foefee and Hemel Bailiff, Elkanah Settle. Skipping nearly two centuries, in 1772 John Baldwin of Tile Kiln, (no occupation given), appeared on the Militia list for Hemel Hempstead. Also on the militia list for this year was William Blunt, a servant from Tile Kiln. Baldwin & Blunt again appeared on the Militia lists for 1778 where it was noted that Baldwin, a servant, was deaf. With time and patience at HALS, a great deal more could be discovered concerning this property prior to the 19th century – a treat I shall look forward to. 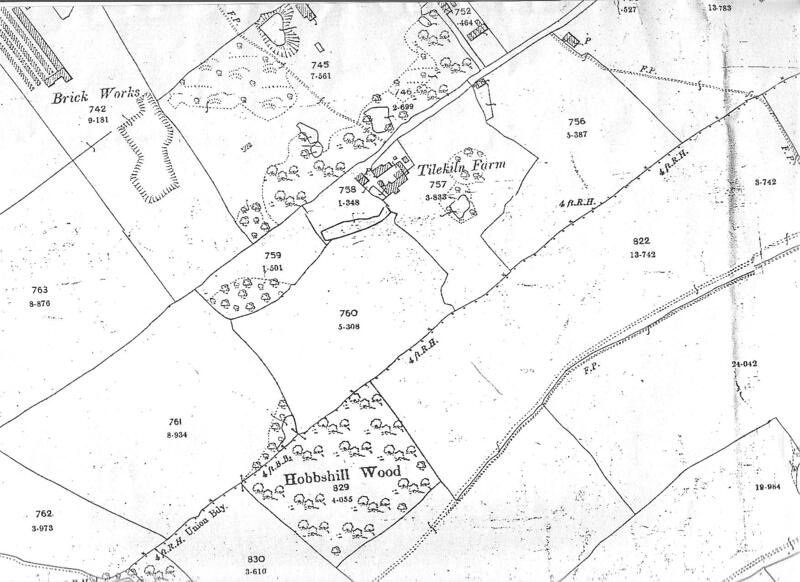 During the 19th century records clearly show that brick and tile making were centred in the area around Tile Kiln farm. 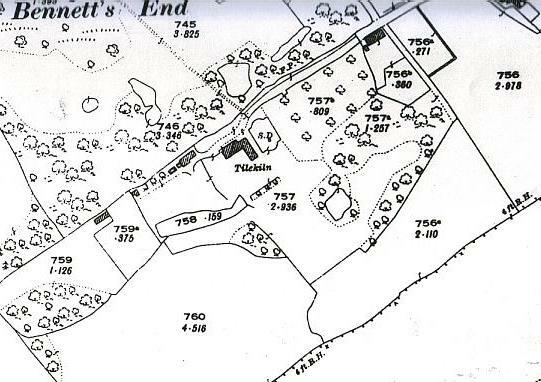 The tithe survey of 1840 shows Tile Kiln Farm itself was owned jointly by John Edwin & Joseph Finch, with John Edwin, Thomas Franklin and others named as the occupiers. I surmise that the Farmhouse operated predominantly as the local brickwork’s Head Quarters. The farm was given as being 52a 3r 37p in size. On January 22nd 1849 the housekeeper from Tile Kiln, home of Thomas Franklin the Brickmaker, died aged 65. Mrs Ann Lowe had been housekeeper to Mr. Franklin for 41 years according to the inscription on her memorial in St. Mary's churchyard. This part of Leverstock Green – that is the far end of Tile Kiln Lane, was now being referred to as Bennetts End, and Thomas Franklin from Tile Kiln Bennetts End died aged 76, and was buried on 31st March 1855. Even though the graveyard at Holy Trinity was now open for burials, Franklin was buried at St. Mary's with his first wife, and two children. His second wife was also buried at St. Mary's. The 1851 census (i.e. 4 years before Franklin’s death) shows Thomas Franklin to be living at what was probably Tile Kiln Cottage. His occupation was given as a Brickmaker. John Edwin & family occupied Tile Kiln Farm, and his occupation was given as Land Proprietor and Farmer of 50 acres. The 1851 census also shows Franklin’s sons and grandsons living in many of the Brickmaker’s cottages (most of which are still standing) along Tile Kiln Lane, with their families. The Farm & its agricultural land appeared to be owned and run by John Edwin, but the principle revenue came from the Leverstock Green & Acorn Brick Company, .run by Franklin. By the census of 1881 the farm (given this time as being of 51 acres) was occupied by John Beckley, aged 27, a farmer, and his family. It seems unlikely that Beckley was the owner as well as the occupier of the farm. 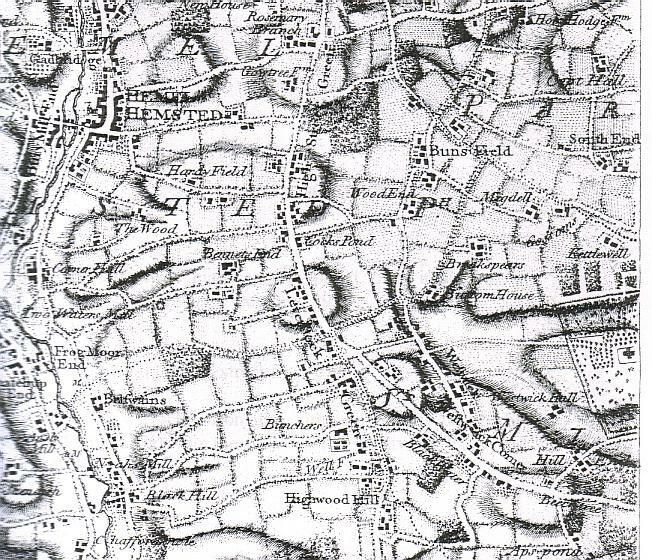 By 1897 the brickfields immediately around Tile Kiln Farm had been worked out and abandoned in favour of some further down Tile Kiln Lane and further out towards what is now Acorn Road. I believe at this stage the farm and the brickfields to be owned and run by Daniel Norris, as Kelley’s directory of 1898 refers to him as one of the village’s two brickmakers’, and it is he who puts Tile Kiln Farm on the market on 1905. Yet strangely the 1901 census gives no mention either of Tile Kiln Farm amongst the many properties in the Bennetts end area, nor of anyone called Norris. Having seen the original enumerator’s entries, I believe he must have omitted to walk up the far end of Tile Kiln Lane, believing the road to only veer to the right (at point B below) towards Bennetts End Farm. This wasn’t his only error, he omitted Cox Pond Farm, but realising his error tacked it on at the end of his submissions. LEFT:1877 25inch:1 mile map extract (reduced) showing Tile Kiln Farm and Tile Kiln Lane. 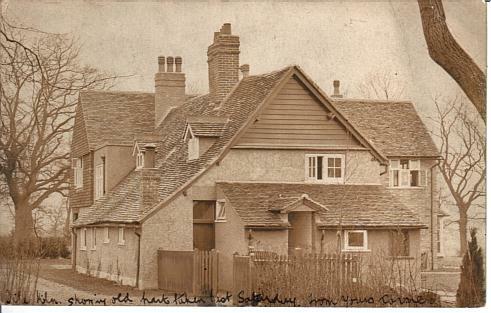 Tile Kiln Cottage, Tile Kiln Lane (just beyond the bend in the road at B) is still there today. BELOW: The same scale map but this time 1897 edition. Click on thumnail to enlarge. 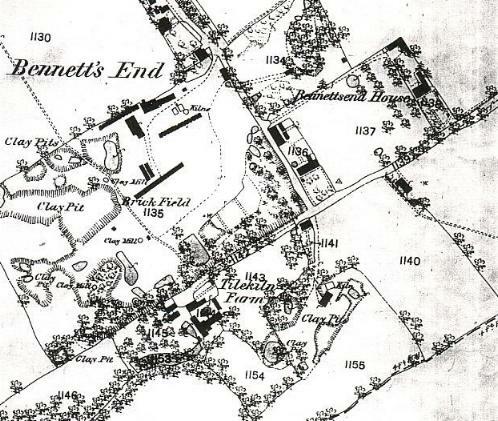 In April 1904 an advert appeared in the Gazette advertising the sale of: TILE KILN FARM BENNETTS END. 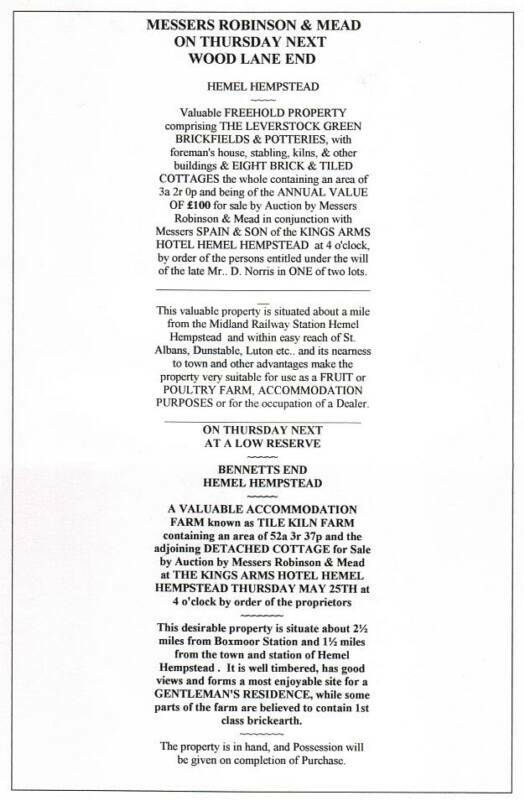 A further advert appeared in mid July stating the farm to be sold “ by auction at Kings Arms Hotel Hemel Hempstead Thursday June 30th three o’clock.” Whether or not the property was sold is uncertain, but by May of the following year preliminary notices appeared in The Hemel Hempstead Gazette advertising the sale by auction of the brickfields at Woodlane End, and Tile Kiln Farm: MESSERS ROBINSON & MEAD are instructed by the Proprietors to sell by auction AT AN EARLY DATE all that valuable ACCOMODATION FARM known as Tile Kiln Farm SITUATED IN Bennetts End Hemel Hempstead together with the DETACHED COTTAGE. A further advert appeared at the end of May. IMPORTANT PROPERTY SALE AT HEMEL HEMPSTEAD ~~~~FARMS & BRICKFIELDS ~~~~ There was a large and interested company at the Kings Arms Hemel Hempstead on Thursday on the occasion of an important sale by Messers Robinson & Mead. 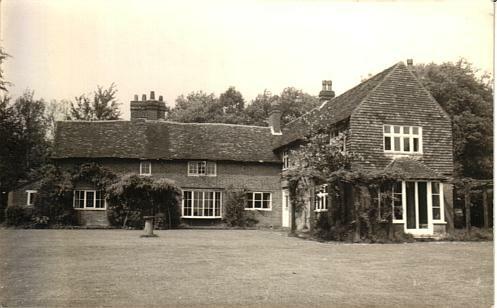 By 1907 John Knox Hart had sold on the house and some land to Mr W. Bessant, and Kelley’s Directory in subsequent years, listed Mrs Bessant as a Private Resident at Tile Kiln. 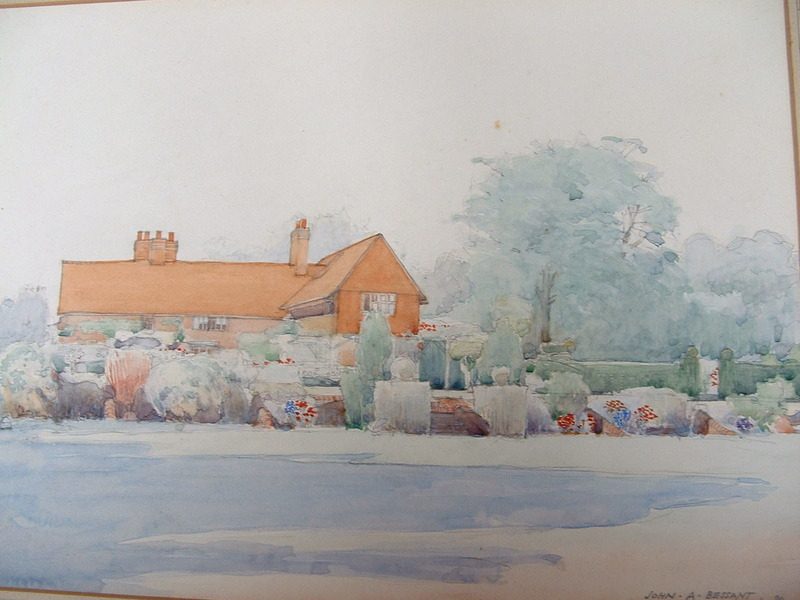 The Bessant family were the last owners of Tile Kiln, and I was very fortunate to make contact with a member of the family who provided me with a great deal of information concerning both the family and the property, including photographs taken at about the time the Bessants moved in 1907, and a charming watercolour painting of the property made by John Bessant in 1929. 1907 The rear of Tile Kiln showing the old part of the house. 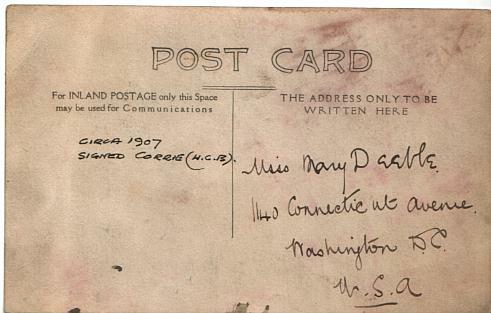 Mrs Bessant (Anne) died in 1954. The remaining members of the family living at Tile Kiln were eventually to move in the mid 60’s from Leverstock Green to live in St. Albans. Rumour had it the property had become too damp to live in. Two new houses: High Beeches and Kiln Lodge were built in part of the grounds. The house itself still showed on the 25" OS plan of 1968 but (despite its great age - it apparently had been overlooked in the listing process), was eventually demolished some time later, and with its remaining grounds, redeveloped into Kinderscout, a new cul-de-sac built off Crofts Path. This painting was done by John Bessant in 1929 and shows virtually the same elevation as shown in the above 1925 map. The gardens were obviously delightful - but then roses grow well on clay soils.